A 4.6 magnitude earthquake shook Monterey County last Monday, and the area hasn't stopped shaking since. 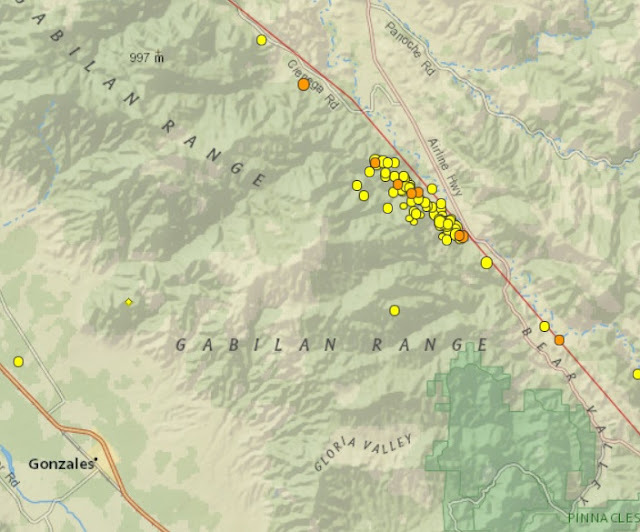 Last week's widely-felt quake was centred 13 miles northeast of Gonzales, along the San Andreas Fault. Since then, there have been 134 earthquakes within 5 kilometres (or about 3 miles) of the epicentre, according to the U.S. Geological Survey. However, most of those aftershocks weren't felt by the Central Coast. Only 17 were stronger than a 2.5 magnitude and six were greater than 3.0, said Ole Kaven, a seismologist with the USGS. "This one has been a quite productive aftershock sequence," said Kaven. "We suspect there will be aftershocks in the 2 to 3 [magnitude] range for at least a few more weeks." Smaller shakers could continue for even longer. Last Monday's quake occurred on a "creeping section" of the San Andreas Fault, so seismic activity in the area is normal, Kaven said. There were no reports of injuries or significant damage. Still, a 4.6 quake is on the "higher end of what we expect in terms of magnitude" for that area, Kaven said. Similarly sized earthquakes were recorded in the same spot in 2001, 2004 and 2011. In each case, the USGS observed a pattern of aftershocks like we are seeing now. "It's a reminder that we live in earthquake country," Kaven said.